One of my favourite trends sweeping the scene this fall is menswear. I am particularly fond of the combination of vests and blazers. Even a vest and a tie gives your every day jeans a nice, polished look. Suspenders have also been spotted out and about, but they are still largely a part of street style and appear to have not yet hit the mainstream. I'm not a fan of the large, tailored slacks with this look (ala Annie Hall) but I do like them with some skinny jeans or trim trousers. The whole look goes to show that just because a pattern or color scheme is traditionally male doesn't mean it's for boys only. I think some of the items we have on finestationery.com illustrate that idea. For example, I have always loved the tan houndstooth card from Toccare and think it is a really smart card. The grey argyle and grey pinstriped cards from Prentiss Douthit are incredibly beautiful and definitely something for men and women. 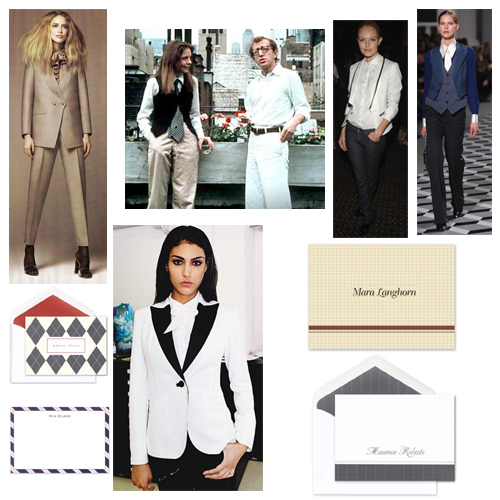 Sporty stripes, like those seen on ties, look smart under a vest or on one of Boatman Geller's flat cards. I'm interested to see how this look will transition into spring. The colors are dark and reminiscent of Fall/Winter and I am having trouble imagining them reincarnated for Spring/Summer '08. I can certainly see them remixed in fall '08 for a 1940s and 50s trim look. Perhaps that's just wishful thinking on my part.